To explore this, let's draw a diagram that labels all the forces on the sailboat. If you haven't seen a force diagram before, not to worry—it's just a few arrows and triangles. By adding the forces together we will get the total force on the boat and thus the direction in which it will move. Here's a basic sailboat. The two parts we will focus on are the sail above the boat and the keel below the boat. The keel keeps the boat from tipping over and, as we shall see, plays a crucial role in moving the boat forward. Now let's say we're trying to sail upwind with the wind coming from the left or "port" over the front of the boat. This sketch shows the sailboat as if we were looking down on the boat as it moves towards the top of the sketch. Looking down on a sailboat, showing the equal and opposite forces on the wind and sail. The wind fills the sail into the shape of a wing, but because the sail is held fast at both ends, the wind can't push it out of the way. Instead the wind must change direction to flow parallel to the sail. 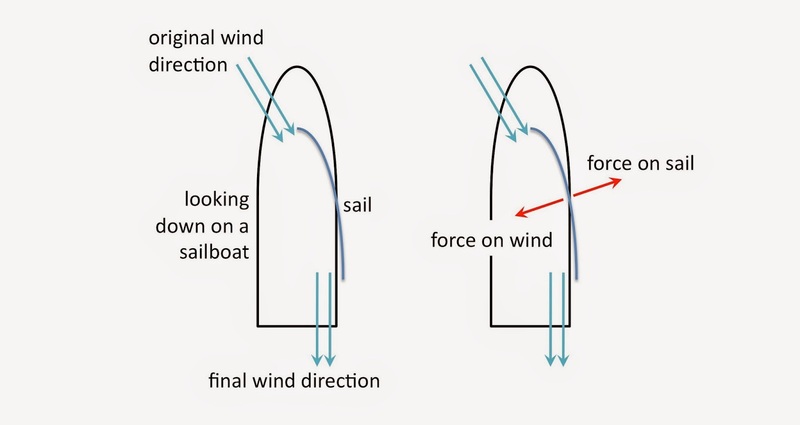 The taut sail has created a force on the wind that causes it to change direction and Newton's third law tells us that there is an equal and opposite force on the sail by the wind, as shown by the red arrows in the diagram above. If this was the only force acting on the boat, then we would be in trouble: the boat would move forward but also to the right. 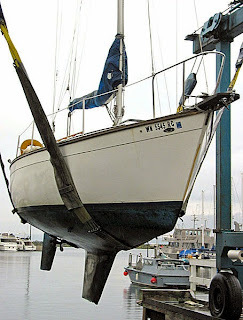 But sailboats have a secret weapon hidden below decks: the keel. Keel and rudder below a sailboat. In addition to the force on the sail, the large area of the keel resists being dragged sideways through water. You can feel this resistance if you drag your hand palm-first through water compared to edge-on. The water applies a force to your hand that increases with greater surface area. 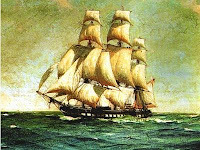 Forces acting on a sailboat cancel each other such that the total force moves the sailboat forward. The downward pointing keel is outlined by the dashed rectangle. 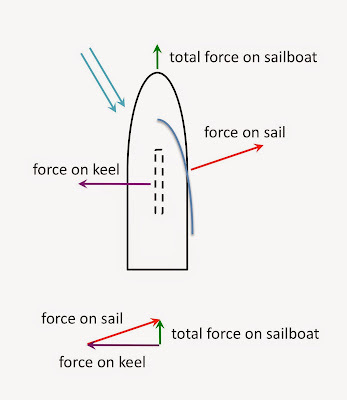 This force on the keel is shown by the purple arrow in the diagram above. 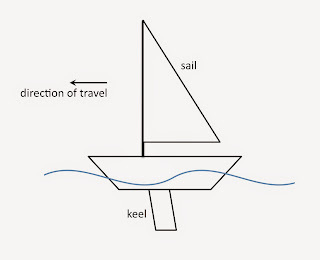 By combining the force on the sail and the force on the keel (triangle diagram), we see that the sideways forces are cancelled out and the total force on the sailboat is only in the forward direction (green arrow). The result is that the boat moves forward! 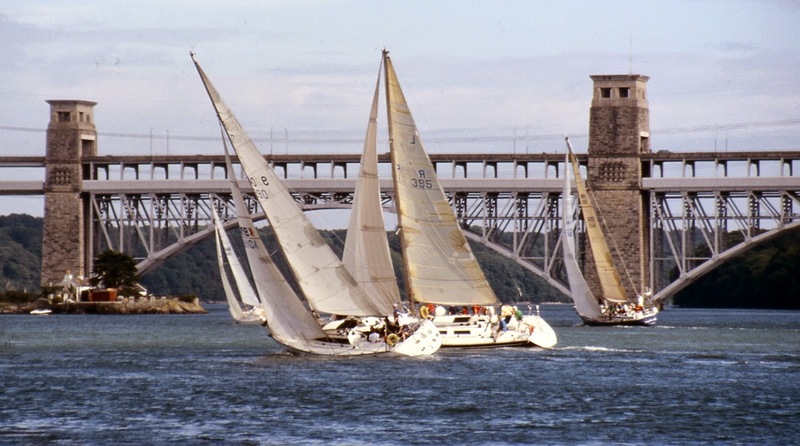 Some sailboats can even move faster than the wind itself. When sailing upwind, the relative speed of the wind on the sails is greater than the actual speed of the wind and this relative wind creates a larger force on the sails that can push sailboats faster than the actual wind speed. There is a limit to how fast sailboats can move forward, of course. 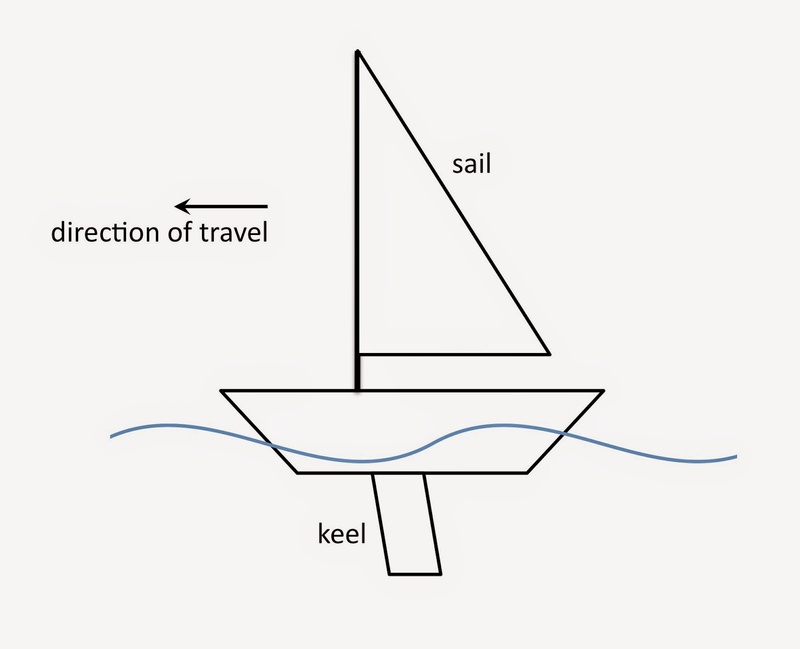 I have ignored boat drag in this example, but the boat also has an inherent friction as it moves forward through the water. The boat will accelerate until the force pushing the boat forward is balanced by the drag force pulling the boat back, and then the boat will travel at a constant speed. Sailing without an engine is really admirable. In the past sailing for months to reach a shore must have been really difficult task ! Thank you.Now i might understand pirates of caribbean a little more :p but seriously thank you. Got a good basic idea from this article. Im sooooo tried rn and this is not easy to read so i think that you should make it simpler, maybe with bullets. Maybe more pictures so it's better to understand. Very thorough (and understandable!) explanation of upwind sailing. My several sailing friends were starting to grow tired of me asking how it works, but this lays it out perfectly. Even they are impressed by the article. Thanks for sharing the knowledge in a relatable way. Thank you very much, I knew this already but this is a very clear explanation that I can use as a guide for my friends who need this explained. 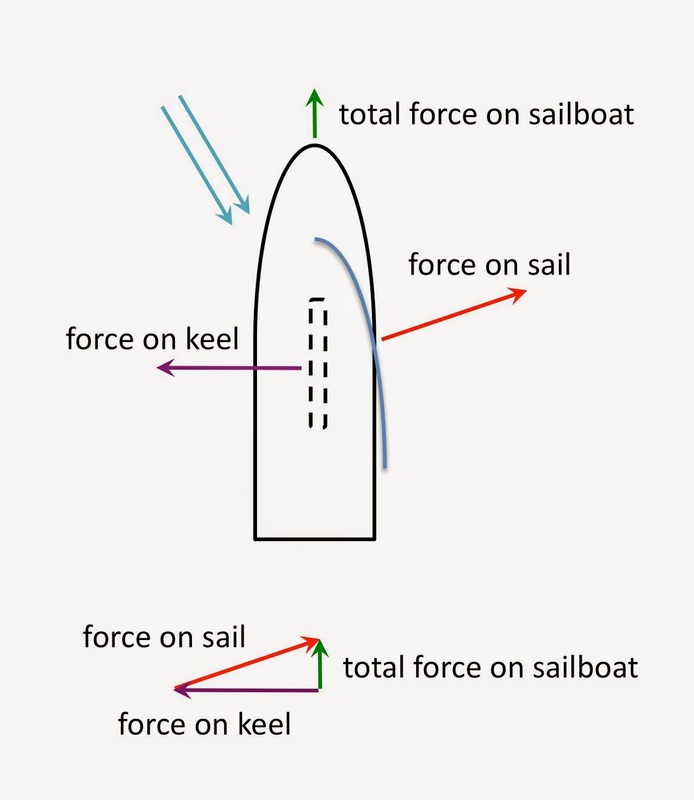 Does the position of the mast relative to the center of the boat (it is usually in the front) matter since all of the force from the sail is transmitted to the point of the mast? I've never sailed in my life and tbh I'm here to learn the physics of sailing for use in a video game. However, I found this info concise and clear. Thankyou. you so good that my teacher is using this for school.